As always, week 1 provided its fair share of injuries across the NFL landscape. Numerous playmakers and key cogs of various teams will be sidelined anywhere from days to weeks to months as teams assess the damage between now and week 2, which officially gets underway on Thursday night. We will keep an eye on this week's official injury reports, the first of which will be published by teams on Wednesday. Be sure to keep tabs on those players who have not yet been ruled out, and have contingency plans in place for any player who faces a realistic chance of missing week 2. - Dez Bryant is set for a spell on the sidelines after breaking his foot during Sunday's comeback win over the Giants. Dez will miss anywhere from 4-8 weeks, which means Tony Romo will put his faith in the hands of longtime go-to-guy Jason Witten first and foremost, with Terrance Williams, Cole Beasley and Devin Street absorbing bigger roles at the receiver positions. Additionally, Bryant's absence could thrust Lance Dunbar into the FLEX discussion due to his skills in the passing game. Dunbar lined up as a receiver multiple times in Sunday night's game. - T.Y. Hilton has been labeled "day-to-day" by Colts' coach Chuck Pagano after susffering a knee injury during his team's week 1 loss at Buffalo. Per Pagano, Hilton is experiencing "a little bit of swelling," but appears to have avoided any major structural damage. Hilton and the Colts get an extra day to heal and prepare as they don't face the Jets until Monday night. If Hilton can not go, both Andre Johnson and Donte Moncrief will see a notable spike in their workloads, with Phillip Dorsett seeing extra snaps as well. - DeSean Jackson is set to be sidelined for at least 3-4 weeks due to the hamstring injury he picked up in week 1 against the Dolphins. DJax shook off a preseason upper-body ailment to return in time for the season opener, so it's been a rough go of it for the former Eagle. While he's out, Kirk Cousins will turn to Pierre Garcon and Andre Roberts, who is a sneaky boom-or-bust play in week 2 against the Rams. - Andre Ellington just can't catch a break. The Cardinals' back - who was bothered by foot and groin injuries a year ago- sustained a knee injury during Sunday's win over the Saints. Ellington was having quite the day before going down in the second half, and his exit opens the door for former fantasy stud Chris Johnson and rookie David Johnson to see more time. Stepfan Taylor will be in the mix, and taxi squad favorite Kerwynn Williams could get promoted while Ellington sits. His injury is believed to be to the PCL, which usually does not require surgery. Coach Bruce Arians has not yet officially ruled Ellington out for week 2, perhaps a positive sign in regards to his initial 2-3 week recovery timetable. Fantasy owners will be hopeful that Ellington can make it back in time for week 3. - Ellington's teammate Michael Floyd was able to play in week 1 against the Saints, but was obviously limited by his hand injury as he totaled just 9 snaps. Expect him to continue to be limited in week 2. When he does return to full strength, Floyd's value should increase, but he is down the receiving pecking order behind both John Brown and Larry Fitzgerald. 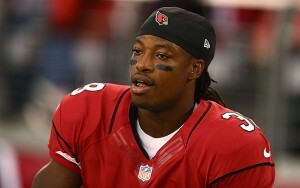 Andre Ellington has suffered another unfortunate and untimely injury for Arizona. - Terrell Suggs is a huge loss to both the Ravens and IDP managers after suffering a season-ending left achilles injury against the Broncos. Suggs tore his right achilles in 2012, but did not miss a game the following season. The 32-year-old was still considered one of the best pass-rushers in the game before this latest injury. - The Bears receiving corps has been a walking M*A*S*H* unit for the last few weeks with Alshon Jeffery, Eddie Royal, and Marquess Wilson all nursing injuries in the build-up to week 1. Additionally, rookie Kevin White will miss the first several weeks of the year after landing on the PUP list with a leg injury. Jeffery will likely continue to be limited in practice but should be available for week 2. Royal and Wilson should both also be fine ahead of Sunday's game with Arizona. - Josh McCown is in the league's concussion protocol after taking a big hit while trying to score against the Jets on Sunday. McCown helicoptered to the ground after a hard hit from multiple Jets players while he tried to extend the ball over the goal line, ultimately fumbling. Johnny Manziel came in and had a seesaw afternoon. Cleveland is approaching week 2 as if Johnny Football will be under center against the Titans. - Dwayne Bowe did not play due to the hamstring injury which has kept him out of practice, and coach Mike Pettine revealed that the 30-year-old suffered a setback in his recovery during the week. Bowe's return would be helpful for the Browns and Johnny Manziel, who has excelled in the past when he has the services of a big wideout (Mike Evans, Josh gordon) to target down the field. Bowe looks like he is currently sitting on the doubtful side of questionable ahead of week 2. - Demaryius Thomas suffered a hand injury during his team's win over the Ravens in week 1. He should be fine for Thursday night's game against the Chiefs despite the short week. - Arian Foster missed week 1 with the groin injury he picked up in training camp last month. His initial recovery timetable has shrunk, though his week 2 status is still uncertain. The team is hopeful that Foster can return by next week, though the 29-year-old has been telling teammates he believes he could play against the Panthers on Sunday. Stay tuned. - Marqise Lee is set to resume practicing this week according to coach Gus Bradley. Lee missed week 1 with a hamstring problem. Even if he plays in week 2, he is down the pecking order in Jacksonville and is not a real fantasy option as things stand, with Allen Hurns and Allen Robinson dominating the targets from Blake Bortles. - C.J. Spiller was thought to be nearing a return for week 2, though his status remains unclear at this point. He was still not practicing last week after undergoing knee surgery last month, though at the time, it was thought that he would be available for week 1. At present, Spiller should be considered very questionable, if not doubtful for week 2. - Victor Cruz still faces an uncertain immediate future, and is considered week-to-week with the calf problem which forced him to miss week 1. As of last week, Cruz was still yet to resume running, and this ailment is likely tied to the serious knee injury which ended his season last year after just 6 games. Until Cruz returns to practice and finally plays, he is off the fantasy radar. - Zach Ertz should be fine moving forward as he played in 70 percent of the Eagles' snaps in Monday night's loss to the Falcons. He ended with a 3/46 line, but played more than Brent Celek despite concerns he may be limited after offseason sports hernia surgery. In the long haul, Ertz iz a TE1. - Derek Carr left Sunday's loss to the Bengals with a hand injury. Matt McGloin played in his place. Carr has not yet been ruled out for week 2, and Oakland is said to be optimistic about their second-year passer's chances of playing. He is said to be dealing with a bruised right (throwing) thumb. - Reggie Bush exited Monday night's win over the Vikings with a calf injury, bringing his 49ers debut to a screeching halt in the first quarter. Carlos Hyde went off as he absorbed the remaining majority of the backfield work, and with Bush expected to miss at least a week, Hyde should remain an elite option heading into this weekend's trip to Pittsburgh. Bush was walking without a limp after the game, but is expected to undergo an MRI on Tuesday. - Tre Mason's hamstring injury forced him to miss the Rams' week 1 win over the Seahawks. His status remains unclear heading into week 2, and with Todd Gurley not expected to play until October, Benny Cunningham remains a viable fantasy option with a voluminous workload. - Mike Evans missed week 1 as the Jameis Winston era in Tampa got off to a forgetful start. Evans' absence opened the door for Austin Seferian-Jenkins to see extra targets. Evans' hammy will be re-evaluated this week. - Delanie Walker is expected to play despite injuring his hand in week 1 against Tampa Bay. Coach Ken Whisenhunt said Walker was wearing a splint on his hand as a precautionary measure. His name will almost certainly appear on tomorrow's official injury report, but all signs point to Walker suiting up. - Titans RB Antonio Andrews missed week 1 with a lingering hamstring injury and will be considered week-to-week. Bishop Sankey, Terrance West and Dexter McCluster will carry the load while Andrews and David Cobb (calf/designated to return IR) are out. Be sure to check back with us as we approach week 2. We'll do our best to keep you up to date on any changes or additions to the weekly injury report. Remember: the league's official injury reports come out Wednesday and will be updated through Saturday.